Note: It may seem strange to put forward the proposal below by Peter Bohmer for a radical universal basic income shortly after the extremist Republican tax plan was passed in the senate. The tax cuts are a grotesque money grab on behalf of the wealthiest people in the United States. The money grab comes at a time when three people have the wealth of half the population and when corporate profits are soaring while workers struggle with survival. According to the Tax Policy Center, by 2027, the top one-fifth of earners would receive 90 percent of the tax bill’s benefits. The bill’s highlights are a dramatic cut to corporate taxes at a time when corporate profits are high and protection of wealth estates so the US moves from an oligarchy to a permanent wealth aristocracy. This tax reduction for the wealthy and corporations is going to have a political bommerang effect which will create an opportunity for a radical shift in the economy if the popular movement is prepared to urge economic justice. There are proposals that are beginninf to create a new economy platform that would correct the errors of recent administratons from both parties, especially the current extreme policies of the Republicans who control both Houses of Congress and the presidency. These proposals create a vision for economic democracy where the country makes major steps toward economic equality. Among the areas this new economy describes are expanded and improved Medicare for all, relief for students and recent graduates, economic security for most Americans in a country where two-thirds cannot afford a surprise $500 expense and economic security for workers by providing methods for them not only to have income but to build wealth, e.g. by becoming owners of workplaces in cooperatives. The proposal for a radical not neoliberal Universal Basic Income should be front and center for this economic vision. What makes this proposal radical is not just the universal income but providing income for those under 18 as well as urging continuing and expanding social safety net programs as well as funding it by taxing the wealthy. It will be critical for the movement for economic, racial and environmental justice not compromise and allow a weak version to be put forward by elected officials or either corporate duopoly party, i.e. an inadequate, small basic income that includes cuts to the social safety net will be counterproductive to building the equality that is needed. 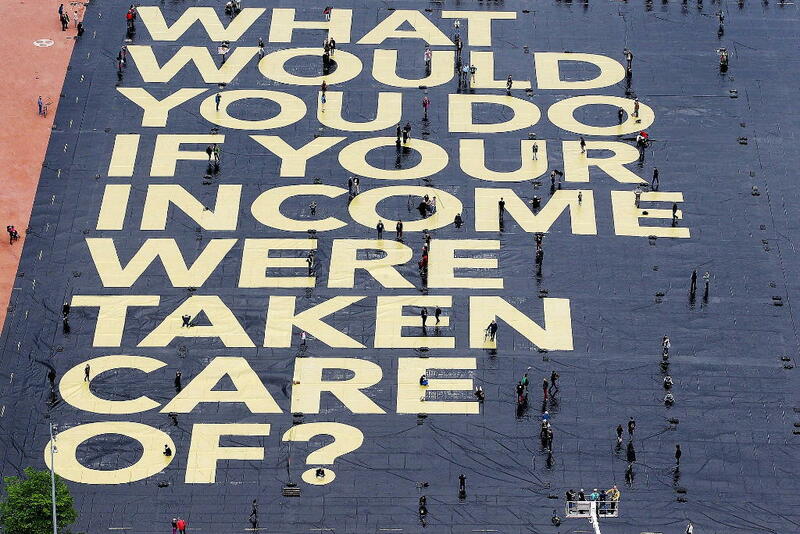 The movement must be educated and uncompromising in refusing a watered down basic income. The Universal Basic Income(UBI) is getting increasing attention in the United States, in particular from Silicon Valley, and also in many other countries in the world. The idea of the universal basic income is that every resident in a society would get a certain income that’s not attached to their work. The numbers I’m suggesting to start with for the United States are $1,000 a month for each person over 18 and $500 a month for each person under 18. These amounts would increase annually to keep up with inflation and would also rise as productivity increases. To illustrate the idea, let’s take a family of two adults—two parents 18 and over and two children under 18. They would receive $1,000 for each adult and $500 for each child, which would total 3,000 a month. That is $36,000 a year, which is about 1 1/2 times the official poverty line. In addition, it would offer a housing allowance in high rent cities. That’s the basic idea. Note: When I am talking about a Universal Basic Income in this interview, I am analyzing the version or a similar one as described in this and the next section. There are also many neoliberal versions which I criticize later in this interview. How could your version be funded? Before I answer that, I need to provide some context. The United States population for 2016 was 323 million, 75 million under 18 and 248 over 18. This program being universal should include all immigrants, ex-prisoners and all income levels; this would make the total cost three and a half trillion dollars. That’s what we would have to finance. While that sounds big, there would be some savings; possibly the UBI could replace food stamps, TANF (the cash welfare program), and possibly some disability payments as individuals and households would receive a larger monthly cash payment from the UBI than these programs. But assuming we would keep most social programs, and even expand them, the total cost of the Universal Basic Income program would still be less than 20 percent of national income. To ensure this guaranteed income wouldn’t be inflationary we would need taxes of about 20% of national income to pay for it. This is a large amount but economically feasible. The challenge is political not economic. Implementing differing tax rates for people in the top half of the income distribution with low additional rates beginning if you are above the median household income, above $57,000 a year; and progressively higher additional tax rates at higher incomes with the highest income tax rates on the top one percent of the population who earn about 22% of national income. That would cover that 20 percent of national income. So it’s feasible. Hopefully some of the UBI would be financed by major cuts in the military and national security state budget. There would still be a lot of inequality in the United States, but it would be significantly less than now. Alternatively to raise the necessary revenues, we could tax income a little bit less and have, for example, a tax on wealth of just the top 1%. For example, they could pay a tax of 2% on their wealth every year—that would yield a good amount of revenue. So by a wealth tax on the wealth of the top 1%, and an additional progressive income tax on higher-income households, everybody in the bottom half of the population, 50%, would receive this full Universal Basic Income in addition to their wages. Others, the 40% of the population with incomes below the income of the top 10 percent still would have more than now. In this proposal, the UBI would be in addition to Health Care, Child Care, Head Start, education, housing allowances and other social programs; that’s why we have this high cost of the program. How does this address inequality? It addresses inequality in two ways. It would make income more equal because for low-income people, every household will now be above the poverty line because they would receive the Universal Basic Income (UBI). Income for everyone but the top 20% would rise substantially with this proposal. This program would be financed by taxing the wealth and/or the income of higher income people so they would have less income than they have now. So it wouldn’t end inequality, but it would make it less extreme. The bottom would be raised up and the top would have less income. The second way is it increases the bargaining power of workers. If somebody offered you a minimum wage job at Burger King where you are treated totally disrespectfully you would say I’m not going to take that job unless you pay me a better wage and treat me with respect and dignity. So employers to get workers would have to raise wages and treat workers better. Even if it’s a rough sketch I want you to imagine how this could unfold in the United States. That’s a difficult question. I don’t see this type of Universal Basic Income as a program we will win in the immediate future. We need to first do popular education to explain this idea, which builds on the philosophy that it is a basic right of each human being to have their basic needs met . The UBI can be the embodiment of the belief that income doesn’t have to be totally tied to making profits for somebody else. So we need to do education that makes that belief “common sense” and worth fighting for. The good news is that we’re not totally starting from scratch. There is increasing interest in the idea, more in other countries but also in some of the socialist groups like the Democratic Socialists of America. A successful movement for the Universal Basic Income would have to tie itself to other movements. For example, it should connect to issues of anti-racism and women’s equality as poverty disproportionately affects women, Latino, Native American, and Black people. The UBI would disproportionately benefit people of color, and women of all racial groups. So when you say popular education where do you think that’s going to happen? Is that going to happen in public schools, inside of unions, in workshops like the ones we hold at Traditions in Olympia? When I say popular education, I am not sure labor unions will play a major role as many are worried the UBI will further weaken them. However, I don’t this think this is so. For example, the UBI would work like an additional strike fund where striking workers would receive the UBI in addition to any support from their union. Workers would be more able to go on or stay on strike. Also, unions have cut back on education of their members. I hope unions take the UBI up together with demands that would make it easier to get union recognition. I see popular education and building support for the UBI, primarily coming from community groups, like Economics for Everyone in Olympia, where the idea is really discussed in-depth. Explaining the UBI in the alternate and social media but also organizing to get good coverage of it in the mainstream media is important. I’ve already seen quite a few articles in the mainstream and alternative media on the UBI. Doing popular education and debating the Universal Basic Income is a first step. After that first step, what comes next? Once people know about the Universal Basic Income then is it a candidate that inspires people like Sanders who promotes it? Step Two! It seems possible to win this on an experimental level like having it exist first in certain communities. Maybe having the UBI in a few communities or in a State like California where there is currently a pretty liberal government. So by developing a campaign for the UBI, it could happen first in some places in California, then possibly statewide leading to a national discussion. The financing of it would be difficult on a less than national level because taxes on high-income people would increase substantially to pay for it and the high-income and wealthy would threaten to and might actually move if their local or State taxes increased substantially to fund the Universal Basic Income. There is an increasing critique of capitalism in the United States, even though most social movements are weak now. I just saw some recent polls that reported that among people under 30, socialism is more popular than capitalism by a three to two ratio, which is really significant. Also, for African-Americans as a whole, socialism is a more popular concept than capitalism. UBI could or should be one part of an anti-capitalist program and strategy as it puts forward in part, the principle that income should be determined by need. You were talking about how leaders in Silicon Valley are interested in this, which seems unexpected. In the past capitalists have occasionally wanted some kinds of reforms but this seems like a pretty significant reform. So in a sense there is momentum behind the first step you laid out. Why would some capitalists and managers want this? There are several reasons why there is growing interest from wealthy people in the technology industry. One reason is many of them are predicting with the growth of artificial intelligence and other technologies that further automation there will be less jobs and less job security for most. So there is a need for a buffer, income without a job. The second motivation is connected to job loss. They are worried about decreasing aggregate demand caused by higher unemployment and underemployment, which will lower the ability of people to purchase goods and services. They’re thinking about how to create enough demand when less people have work but still have sufficient purchasing power to buy what can be produced. The third factor is that there’s growing concern about the extreme income and wealth inequality we are experiencing. Trump’s proposed tax cuts, if passed, will even worsen this already obscene polarization of income and wealth. Testing this out at the state level reminds me of weed legalization at the State level having to prove itself as a feasible program. Right and that’s the idea of demonstrating its feasibility at the local level and then gaining much larger support for it. This idea of a UBI does have major interest and not just from the usual suspects, and this raises an important question for me. The radical version others and I want and propose is a really significant program because it would not replace most other social programs but be in addition to them. So the dilemma is that I see as much more possible in the short run is a version of a UBI being proposed coming from mainstream Democrats and a few moderate or libertarian Republicans and some high tech capitalists, a much more limited guaranteed income. One version I’ve read about would be half the income to adults that I’m proposing—$500 a month for adults, much less or nothing or kids, and major cuts to social programs. So I wouldn’t actually support that version because it’s so inadequate, it’s a neoliberal version of the UBI. But the argument in favor of a moderate beginning UBI is that it would be a step toward the kind of program, others and I am proposing. If the minimal version of the UBI was the goal and end-point, it would be a really reformist reform. But although it may be better than what we have now, it would still be totally inadequate and it wouldn’t end poverty or even substantially reduce poverty. This is especially true if it ended programs such as WIC, unemployment insurance, reduced or free school lunches, etc., which has been proposed. So the details of the UBI, what kind, really matter. Taking the modest reform first is similar to saying the Affordable Care Act—which is inadequate given how high the rates are—is a step toward Universal Health Care such as a Single Payer healthcare system. At the very least we should advocate and organize for a Universal Basic Income similar to the one I have been analyzing. OK, the version that you just described is coming from Silicon Valley and other elites. Can you please talk about a version that you think addresses more issues in a way that actually meets a lot of people’s needs for justice? One version of the universal basic or guaranteed income is the libertarian version that can actually be traced back to influential right-wing economist, Milton Friedman. That version is it a lower level of a guaranteed income that I’m talking about and also reduces or ends social programs like food stamps, unemployment insurance, public housing and replacing them with what I am calling a neoliberal version of the UBI— maybe even reducing or ending government-supported health care and Social Security. My version of a universal basic income goes back to what Martin Luther King talked about in the 1960’s or the demands of the National Welfare Rights Organization (NWRO). The NWRO talked about and demanded a guaranteed income of $6,500 for a family of four which is almost $5 0,000 in today’s dollars. My idea of a Universal Basic Income is in that tradition. It is not a substitute for but in addition to needed programs like free and quality education through university for all, a single-payer universal healthcare, guaranteed childcare, access of all to housing, etc. The right to live without being poor should and would be a basic human right of the society. An adequate guaranteed income would make it more possible for women to leave abusive relationships because one would at least receive the UBI and if you had kids your UBI would further substantially increase. It is also a more generalized version of the wages for housework demand. An artist would receive an income and wouldn’t have to take a job they didn’t like to put food on the table or to have their art production dictated by the market. Community organizers and activists would receive an income without having to do a wage labor job they hated or at least work less hours. You’ve mentioned earlier that this guaranteed income would increase the bargaining power of workers. Please tell me about that. In the United States, wages are largely determined by the bargaining power of workers to improve their wages. Right now the bargaining power has been decreasing with the decline of unions, firms threatening to move offshore, and technical change, and this program while being insufficient would increase the bargaining power of workers because they would have the UBI as a minimum. Let’s say you’re facing a minimum wage job where you’re really treated badly, you would have this UBI as a fall back income. You wouldn’t have to take the first job you are offered. You could say you’ll only work if working conditions improve or if I get offered a better wage; so it would improve the bargaining power of workers. We need stronger labor union laws to make it easier to organize but this is one part of a strategy of improving the dignity of work and people’s wages and working conditions. You mentioned that many social programs would still be around. I believe in the right for no one to be poor and for that to happen it means that this guaranteed income would be in addition to healthcare, hopefully universal healthcare. This could not be paid for out of t he UBI that is still set at a low amount, but be in addition. So should subsidized or free quality childcare, government financial aid like Pell grants, job training programs, housing subsidies such as section 8, etc. Certainly most social programs would need to continue to improve. Social security and unemployment would need to continue. It could replace some programs that are straight cash grants like TANF because the Universal Basic Income would be a much higher amount. There would be no work requirement for the UBI. People would only work because the job would improve their lives, not because they absolutely have to. So it would be a way that meeting the basic needs of all beings becomes part of our society. To me, while the UBI could and should exist in a capitalist society, it would not end inequality, worker alienation and exploitation, environmental destruction, racism and sexism. It would improve people’s lives and could be a step towards a participatory socialist society. Hearing you talk about this, not only would it give workers more collective bargaining power over working conditions, it would also force industries to prove themselves as being worthy of existing. Maybe not, there is collective bargaining as a teacher, for instance, and there is a lot of union representation there, but I think people take out all this debt to get their certification and once their done they don’t really have a choice other than sticking with their original choice. I think that’s true in social work too. But if the guaranteed basic income existed, those careers would have to be appealing not just something people have to do. For all jobs. A UBI would increase wages for low and moderate wage workers as it would increase their bargaining power. This would lead to more automation as firms substituted machines for workers. But if people had higher wages and in addition, the UBI, it would mean that people might choose to work less and get higher pay per hour. That’s a benefit. There would be more time for volunteer work and building community; when one works full-time and often overtime or more than one job; one doesn’t have the energy or time to do community activities or fully enjoy life. If you had this income from the UBI and in addition probably from a job but working less hours, it would leave more time for volunteer work, creative work, recreation, family, training, education, and learning new skills. If this program were implemented would you see a change in art and things that don’t automatically have a commodity form? For instance, people who want to become artists—if they’re not immediately good enough or successful—they have to supplement whatever they’re doing with another job. Even if they’re good enough. Maybe they don’t want to produce art for commercial success. Now they have little real choice. It’s not only artists, writers and musicians and filmmakers who would benefit. If you are willing to live in a very modest amount, these very modest amounts of the UBI, you could devote times to basically what you love and want you want to do. This interview appears in the Olympia, WA. based newspaper Works in Progress. Peter Bohmer is a faculty member in Political Economy at the Evergreen State College in Olympia, WA. He has been an activist since 1967 in movements for fundamental social change.